WDI Corp. of Japan has high hopes that its Capricciosa restaurants in Manila will continue to attract a lot of customers in spite of the sluggish Philippine economy. 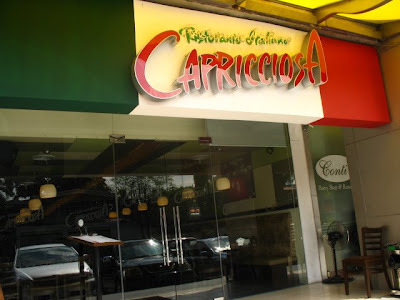 THE first time I ate at a Capricciosa restaurant was when I was living on Saipan in 2004. The restaurant was usually packed with the more privileged residents of the island. I personally thought $25 for one small dish was too expensive (of course in my head I kept on converting to pesos), so I didn't eat there very often. Between that and the $10-Japanese buffet every Friday at Hafa Adai Beach Hotel's Hana Restaurant, guess which restaurant won hands down? Still, I am a fan of Capricciosa's salmon spring rolls, ang sarap I swear! The wrapper is thin and crispy, and when you'd bite into it, there's just the squishy salty and smoky goodness of the salmon. The last time I ate the salmon spring rolls was in Capricciosa's Greenbelt 3, where the food prices are more affordable. Now that the Greenhills branch is open, I think I'll pop over there just to indulge again in my favorite appetizer, and perhaps try out a few of their pastas and pizza with my food buddies. Labels: Capricciosa, Cencio Vy, Good eats, Guam, Japan, Tan Vy International, Vyson Tan, WDI Corp.